My Lord Jesus Christ, I pray you to grant me two graces before I die: the first is that during my life I may feel in my soul and in my body, as much as possible, that pain which You, dear Jesus, sustained in the hour of Your most bitter passion. The second is that I may feel in my heart, as much as possible, that excessive love with which You, O Son of God, were inflamed in willingly enduring such suffering for us sinners. One of the Twelve, who was called Judas Iscariot, went to the chief priests and said, “What are you willing to give me if I hand him over to you" (Matthew 26:14-15). We sometimes wonder how Judas could betray and sell Jesus for such a small sum, but we forget that we often do the very same (though not always for financial gain). Alas! How poorly I tolerate a brother when he has said or done something against me. But you, for so long a time and without complaint, have endured your disciple Judas, who would soon sell and betray you, while I, for a paltry insult, quickly yield to anger and think of various ways of vindicating myself or of offering excuses. Where then is my patience, where is my meekness? Help me, good Jesus, and instill the virtue of your meekness in my heart in greater abundance, for without your inspiration and special grace I cannot enjoy peace of soul amid this life's many vexations. 1. Jesus enters Jerusalem. The crowd of disciples accompanies him in festive mood, their garments are stretched out before him, there is talk of the miracles he has accomplished, and loud praises are heard: “Blessed is the King who comes in the name of the Lord. Peace in heaven and glory in the highest!” (Lk 19:38). Crowds, celebrating, praise, blessing, peace: joy fills the air. Jesus has awakened great hopes, especially in the hearts of the simple, the humble, the poor, the forgotten, those who do not matter in the eyes of the world. He understands human sufferings, he has shown the face of God’s mercy, he has bent down to heal body and soul. Now he enters the Holy City! It is a beautiful scene, full of light, joy, celebration. At the beginning of Mass, we repeated all this. We waved our palms, our olive branches, we sang “Blessed is the King who comes in the name of the Lord” (Antiphon); we too welcomed Jesus; we too expressed our joy at accompanying him, at knowing him to be close, present in us and among us as a friend, a brother, and also as a King: that is, a shining beacon for our lives. And here the first word that comes to mind is “joy!” Do not be men and women of sadness: a Christian can never be sad! Never give way to discouragement! Ours is not a joy that comes from having many possessions, but from having encountered a Person: Jesus, from knowing that with him we are never alone, even at difficult moments, even when our life’s journey comes up against problems and obstacles that seem insurmountable, and there are so many of them! We accompany, we follow Jesus, but above all we know that he accompanies us and carries us on his shoulders. This is our joy, this is the hope that we must bring to this world of ours. Let us bring the joy of the faith to everyone! 2. But we have to ask: why does Jesus enter Jerusalem? Or better: how does Jesus enter Jerusalem? The crowds acclaim him as King. And he does not deny it, he does not tell them to be silent (cf. Lk 19:39-40). But what kind of a King is Jesus? Let us take a look at him: he is riding on a donkey, he is not accompanied by a court, he is not surrounded by an army as a symbol of power. He is received by humble people, simple folk. Jesus does not enter the Holy City to receive the honours reserved to earthly kings, to the powerful, to rulers; he enters to be scourged, insulted and abused, as Isaiah foretold in the First Reading (cf. Is 50:6). He enters to receive a crown of thorns, a staff, a purple robe: his kingship becomes an object of derision. He enters to climb Calvary, carrying his burden of wood. And this brings us to the second word: Cross. Jesus enters Jerusalem in order to die on the Cross. And it is here that his kingship shines forth in godly fashion: his royal throne is the wood of the Cross! I think of what Benedict XVI said to the cardinals: "You are princes but of a Crucified King"...Jesus says: “I am a King”; but his power is God’s power which confronts the world’s evil and the sin that disfigures man’s face. Jesus takes upon himself the evil, the filth, the sin of the world, including our own sin, and he cleanses it, he cleanses it with his blood, with the mercy and the love of God. Let us look around: how many wounds are inflicted upon humanity by evil! Wars, violence, economic conflicts that hit the weakest, greed for money, which no-one can bring with him, my grandmother would say, no shroud has pockets! Greed for money, power, corruption, divisions, crimes against human life and against creation! Dear friends, we can all conquer the evil that is in us and in the world: with Christ, with the force of good! Do we feel weak, inadequate, powerless? But God is not looking for powerful means: it is through the Cross that he has conquered evil! We must not believe the Evil One when he tells us: you can do nothing to counter violence, corruption, injustice, your sins! We must never grow accustomed to evil! ... And we must not be afraid of sacrifice. Think of a mother or a father: what sacrifices they make! But why? For love! And how do they bear those sacrifices? With joy, because they are made for their loved ones. Christ’s Cross embraced with love does not lead to sadness, but to joy! 3. Today in this Square, there are many young people: for 28 years Palm Sunday has been World Youth Day! This is our third word: youth! Dear young people, I think of you celebrating around Jesus, waving your olive branches. I think of you crying out his name and expressing your joy at being with him! You have an important part in the celebration of faith! You bring us the joy of faith and you tell us that we must live the faith with a young heart, always, even at the age of seventy or eighty.! A young heart! With Christ, the heart never grows old! Yet all of us, all of you know very well that the King whom we follow and who accompanies us is very special: he is a King who loves even to the Cross and who teaches us to serve and to love. And you are not ashamed of his Cross! On the contrary, you embrace it, because you have understood that it is in giving ourselves that we have true joy and that God has conquered evil through love. You carry the pilgrim Cross through all the Continents, along the highways of the world! You carry it in response to Jesus’ call: “Go, make disciples of all nations” (Mt 28:19), which is the theme of World Youth Day this year. You carry it so as to tell everyone that on the Cross Jesus knocked down the wall of enmity that divides people and nations, and he brought reconciliation and peace. Dear friends, I too am setting out on a journey with you, from today, in the footsteps of Blessed John Paul II and Benedict XVI. We are already close to the next stage of this great pilgrimage of Christ’s Cross. I look forward joyfully to next July in Rio de Janeiro! I will see you in that great city in Brazil! Prepare well – prepare spiritually above all – in your communities, so that our gathering in Rio may be a sign of faith for the whole world. Young people must tell the world that it is good to follow Jesus, that it is good to love Jesus and that it is good to go out to the preferies of the world and follow Jesus! Three words: Joy, Cross and Youth. Let us ask the intercession of the Virgin Mary. She teaches us the joy of meeting Christ, the love with which we must look to the foot of the Cross, the enthusiasm of the young heart with which we must follow him during this Holy Week and throughout our lives. Amen. To celebrate the tenth episcopal anniversary of His Excellency the Most Reverend Thomas John Paprocki, a good number of the priests of - or who serve in - the Diocese of Springfield in Illinois concelebrated the Holy Mass last evening with the Bishop in the Cathedral of the Immaculate Conception. More than 250 of the faithful also came to pray with and for the Bishop. A reception was then held in the Cathedral Rectory for the priests in which they had an opportunity to visit the third floor, the Episcopal Residence. Many priests who had served for decades in the Diocese had not yet been to the third floor and so enjoyed the visit. At the conclusion of the dinner the priests of the Diocese - included many who were unable to join us last evening - presented a gift to the Bishop in gratitude for his pastoral ministry: a new crozier. The Bishop was touched by the gift and expressed his gratitude to the priests for their pastoral service, together with the joy he experiences at being our Bishop. The evening was a most enjoyable one and a great opportunity for priestly fraternity with our Bishop. 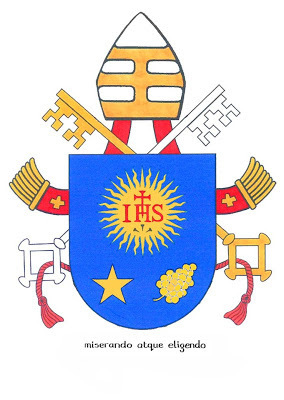 Congratulations, Bishop Paprocki! Ad multos annos! 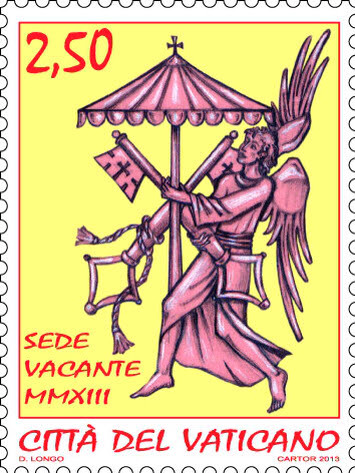 Having received the middle name of Joseph, today I join Catholic men across the globe - including His Holiness Benedict XVI - in celebrating my name-day (there is no Saint Daren, or - so far as I can tell - its equivalent). Saint Joseph,I take you this day as my advocate and defender,my counselor and my friend.Open your heart to meas you opened your home to the Virgin Motherin her hour of need.Protect my holy priesthoodas you protected the life of the Infant Christthreatened by cruel Herod.In darkness bring me light;in weakness, strength,and in fear the peace that passes understanding.For the sake of the tender love that bound youto the Virgin Mary and the Infant Christ,be for me, Saint Joseph, a constant intercessorand a shield against every danger of body, mind, and soulso that, in spite of my weaknesses and sins,my priesthood may bring glory to Christand serve to increase the beauty of holinessin his bride the Church.Amen. 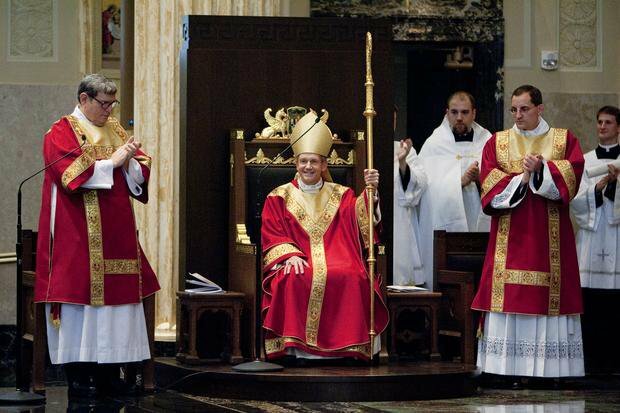 Ten years ago today His Eminence Francis Cardinal George, O.M.I., Archbishop of Chicago consecrated His Excellency the Most Reverend Thomas John Paprocki a Bishop. and the release of The Hobbit: An Unexpected Journey on DVD and BluRay (at least for me). His Excellency will offer the Holy Mass this evening in the Cathedral of the Immaculate Conception at 5:15 p.m.
and as one who serves them by governing. Pope: We must not be afraid of goodness, of tenderness! His motto remains the same: miserando atque eligendo, "lowly and yet chosen". Have you seen these islands? On this day we celebrate what is for us the Solemnity of Saint Patrick, our heavenly patron, with much joy and gratitude to God for the bright light that the example of the Apostle to Ireland shines upon our path. There are, of course, a great many people this day who think they celebrate Saint Patrick, the man who is credited with bringing Christianity to Ireland, with driving snakes from the isle, with using the shamrock to explain the mystery of the Trinity. Beyond this, precious little is known by so many who seek to celebrate his feast. People have put on their green, drunk their beer and will likely dine on corned beef and cabbage for dinner – as many here will do – but in doing so they celebrate a supposed Irish heritage more than Patrick himself. Who is this man that has led to so much revelry, and why does Mother Church continue to honor him? The Church celebrates the lives of the Saints because in them we see the light Christ refracted in a great array of colors showing us the many paths on which we may walk in our daily life in following in the footsteps of Christ Jesus. We see above all in the life of Saint Patrick one who sought to “tell God’s glory among the nations; among all peoples, God’s marvelous deeds,” particularly among the Irish (Psalm 96:3). In many respects, Saint Patrick remains shrouded in legend; even the dates of his birth and death are uncertain. We do not even know when he was ordained a priest or even a bishop. We do know that his father, Calpornius, was a deacon and his grandfather, Potitus, was a priest. His father was also a government official, with an estate worked by slaves. Even so, it seems Patrick was not raised in an especially religious family. Here is one lesson of the Christian life we can take from Saint Patrick: it is in solitude and in times of difficulty that, if we are open to the Lord and humble enough to receive him, his Spirit will stir in our hearts, thus causing us to pray without ceasing. In fasting and prayer, Patrick encountered the Lord and rested secure in his love. Following his example, we, too, can encounter the Lord in moments of great adversity and dire need. For one hundred and eighty-eight miles Patrick walked until finally he found a pagan ship anchored and ready to depart. When first he was refused passage, Patrick prayed and one them shouted after him, “Come, because we are receiving you on faith, make friends with us in whatever way you wish.” Patrick boarded the vessels, hoping to introduce them to Christ. For three days they sailed and landed in a deserted area. After being captured again, Patrick walked for twenty-eight days and at last found himself among us kindred once more; the dream of his heart had been answered. His people, who, he says, received him as a son, begged him never to leave them again. After a time Patrick accepted the call of the Irish, finding in it the will of God for his life which he “learned from Christ my Lord” (241). He gave himself entirely for the people of Ireland so that they might know “the gift so great, so salutary, to know or to love God wholeheartedly, but at the loss of country and kindred” (247). He would later describe himself as “a slave in Christ for that remote pagan people” and in this he found his joy and peace” (285). He once said to those to whom he preached, “Would that you, too, would strive for greater things and perform more excellent deeds. This will be my glory” (257). These words he addresses to us as well, his spiritual children. If we wish to celebrate the life of Saint Patrick and the legacy he has bequeathed to us, we cannot do so with drunken festivities marked with blatant sinfulness; we do so, rather, by striving for greater things, for growth in the virtues of faith, hope, and love. We honor Saint Patrick by striving for holiness. Let each of us, then, parishioners under his patronage, seek to be his glory! Amen. Saint Patrick, Confessio, 1. In Patrick the Pilgrim Apostle of Ireland: An Analysis of St Patrick’s Confessio and Epistola, Ed. and trans. Maire B. de Paor (Dublin: Veritas Publications, 1998), 221. Ibid., 16. In Ibid., 231. Ibid., 18. In Ibid., 233. Ibid., 23-24. In Ibid., 237-238. Our Bishops have issued to us a Call to Prayer and a Pledge to Fast for the intentions of Life, Marriage, and Religious Liberty on Fridays through the Solemnity of Christ the King of the Universe. For all who help to build a Culture of Life: that even in the midst of trials, the Lord would strengthen their faith and help them know His saving power. Let us join our Bishops in prayer today for this important intention, and let us not forget to pray also for the Holy Father Pope Francis. Look at your dignity, you brothers [who are] priests, and be holy since He is holy. And as the Lord God has honored you above all other persons because of this ministry, so you should love, reverence, and honor Him above all others. It is a great misery and a miserable weakness that when you have Him present within you in this way, you concern yourselves with anything else in this entire world. Today turned out to be a quiet mail day, but a very happy one nonetheless. ...often with a Dr Pepper near by. The second item that arrived today in the mail is very much related to the image above. A good friend on Oahu sent me, just for fun, "a Hawaiian postcard." At one point as hiked about the island, he remarked, "For somone who doesn't like coconut, you like to take pictures of coconut trees." I couldn't argue that. The humorous gift brought a much-needed smile to my face at a frustrating moment in the day. By now you've certainly heard that we have a Pope, Francis. Many of you have been asking my thoughts about the new Bishop of Rome. Yesterday being a busy day I didn't really have anything to offer, but now I might. First, it really doesn't matter what I think one way or the other. Whether I approve of his election or not does not change the fact that he is the Supreme Pontiff and that we owe to him a filial devotion and obedience and we should remember him in our prayers each day. We should all remember this. Second, I don't really know anything Pope Francis' background except what I've been able to read since yesterday afternoon. John Allen's piece on him seems to be the best I've read so far. The media - as might be expected - has been making a big deal about his extraordinary care for the poor by trying to juxtapose it against his defence of the teachings of Jesus Christ, as if social justice could should be separated from right belief. In reality, Pope Francis is simply a man who strives to follow faithfully after Jesus Christ by both holding to the truth and serving the least brethren of the Lord. There is in this a great lesson for us all. Third, many are, I think, over exaggerating the displays of his personal humility by stressing such things as his "shunning" - not my word - of some of the papal regalia (at least for the time being). In time he may began to use more of the symbols of his office, or he may not; we do not know. All of this can be a sign of his own humility but this does not mean - as many seem to be suggesting - the wearing of the full pontificals indicates a lack of humility. 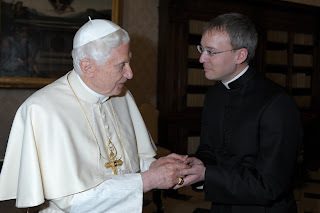 Anyone who has met His Holiness Benedict XVI - who made frequent use of the full papal vesture - knows him to be a man of genuine humility. I do hope Pope Francis will follow the example of Pope Benedict XVI, but he must be his own man. In this regard, I often think of the words of Pope Saint Pius X who hated the regalia of his used but made use of it nevertheless. To one friend he wrote: "Look how they have dressed me up." To another, he wrote, "It is certainly a penance to be forced to accept all these practices. They lead me about surrounded by soldiers like Jesus when he was seized in Gethsemane." To dislike the trappings so much and still to wear them, that shows no less humility than not wearing the trappings; to my mind, it demonstrates a greater humility. There are times when each of us has to do things we would rather not do simply because they fitting. To be sure, I do not write the above as a judgment of Pope Francis, nor do I condmen him; please don't take it as such. He must do what he feels is best. On this matter there can be a cordial disagreement that need not lessen unity. Fourth, what immediately struck me as he walked out on the loggia to greet the world was the look on his face. He seemed to desire to be anywhere else in the world. He look stunned and terrified, really. He did not wave. He did not smile. He simply stood there. When he was appointed Auxiliary Bishop of Beunos Aires, he took as his episcopal motto miserando atque eligendo ("lowly and yet chosen"). As he stood motionless on the balcony looking out upon the faithful the sincerity of these words was most evident. He knows himself to be unworthy of so lofty an office and for this reason I think he will be a fine Universal Pastor. But when the time came for him to smile and to speak to the people, both his smile and his words were genuine and from the heart. He is, it seems, a quiet man who would rather fade away into the background; his new office will not really allow him to do that. I am glad he said accepto and hope the Lord will give him many consolations in the days and years to come. Fifth, his name. For years now people have asked me what name I would choose when I am elected Pope. Confident that this will never happen, I have always said I would choose to be called Pope Francis (meaning the First). Now I suppose I will not be able to do that. Longtime readers of this blog will now of my deep love for and devotion to Saint Francis of Assisi and the Pope's choosing of this name is fitting occassion for me to resume what was once a daily feature on this blog: Ponderables from the Poverello, daily quotes from Saint Francis. I hope that Pope Francis will lead people to learn more about the Poverello and to discover the animal-loving gentle hippy image is far from the reality (Emily Stimpson has a good post on this). From yesterday forward, we will no longer be able to speak of "our Holy Father Francis" with reference simply to the thirteenth Saint who renounced his father's wealth to embrace Lady Poverty and the Cross; now, we will have to be specific: Do we mean the man from Assisi or the man who is the Successor of Saint Peter? Things could be tricky for a while in Franciscan circles. 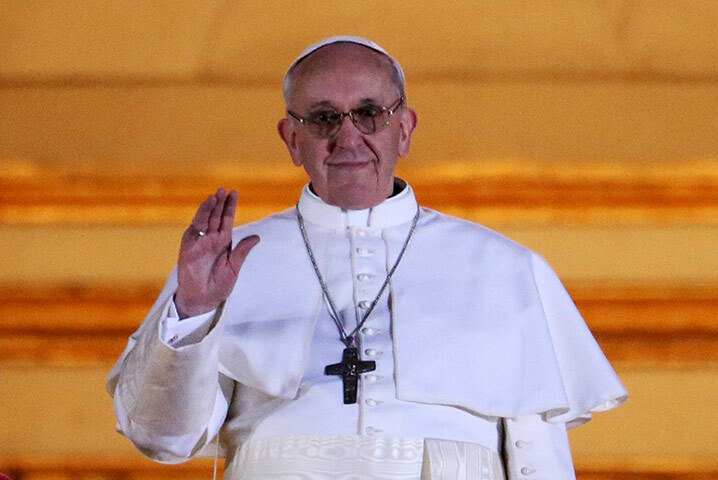 To His Holiness Pope Francis, I pledge my willing obedience and filial devotion, and I promise a remembrance in my prayers. Since June of 1995 the music of Rich Mullins has easily been among my favorite and his music can be frequently heard playing through my iPhone (together with various Hawaiian music). It was Rich who gave me a love of the hammer dulcimer. There is something disarmingly simple in his music; at the same time, his lyrics contain a depth of profundity which strike straight to the heart. Rich had a way of expressing in his music the sentiments of my heart that I often had - and sometimes still do - a difficult time putting into words. Such is the power of music, isn't it? Tragically, he died just a short time before he was to enter into the full communion of the Catholic Church in 1997. Patrick Breeman has a good post over at First Things in which he takes a look at the life of Rich Mullins. He includes in the post a number of quotes from Rich, which are all worth reading. More than ever before, I think that a great part of the Holy Spirit in our lives is played out through what the Catholic Church would call a Eucharistic community, and that’s the thing that is lacking in Protestantism. If Christ is head of the body, the body has to be together. From the Interior Castle, the blog of Cody Sandschafer, who is in the fourth year of philosophy at Bishop Simon Brute College Seminary in Indianapolis. Open Wide the Doors for Christ, the blog of Dominic Rankin, who is in the third year of philosophy at Bishop Simon Brute College Seminary in Indianapolis. Whispers on the Mountain, the blog of Michael Friedel, who is in the second year of pre-theology at Mundelein Seminary. 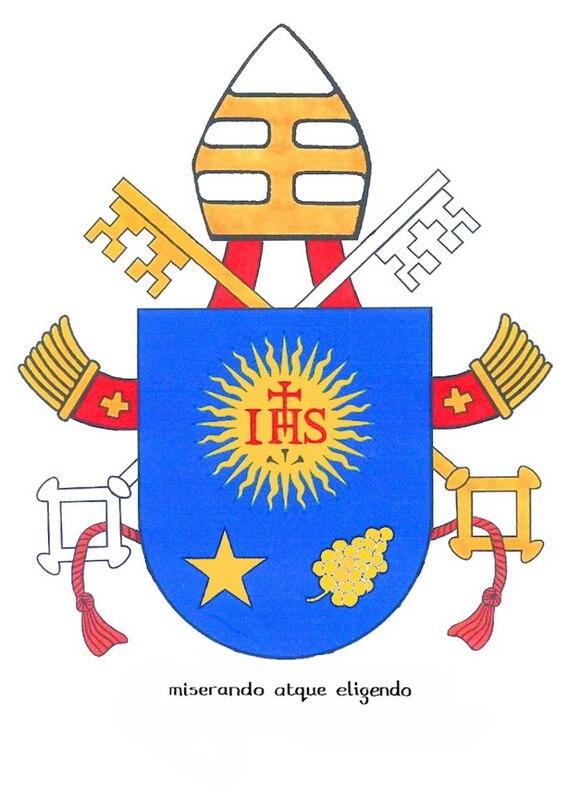 Eucharistic Ecclesiology: Christ and His Church, the blog of Joe Wagner, who is in the second year of pre-theology at Mundelein Seminary. Muddling through My Catholic Life, the blog of Adam Prichard, who is in the second year of theology at Mundelein Seminary. A couple of the blogs, you'll likely note, have not updated in a while. Maybe this will help with that. The Art of Manliness has a great post on a history and how-to of wax seals. It's been a while since I've sealed a letter with wax; I may have to remedy that soon. Matthew Schmidt takes a look at ten weird, wonderful foods for Lent over at First Thoughts. I think I'll pass on the muskrat. The Bad Catholic has a good post on what young people actually want from the Church. I've long hated the phrase "making faith relevant." The World has a story about a Spanish priest who hired graffiti artists to paint the apse of his church, with nice results. I've often noticed that graffiti artists are quite talented, but that their talents are often misdirected. 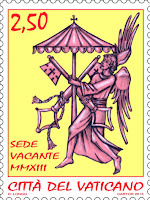 Father Z has a post of interesting papal trivia, notable with the places from which previous Bishops of Rome have come. Over at First Things, R.R. Reno has a post about Gary Wills' new book in which he claims Jesus did not intend the priesthood. Marcus Brotherton writes at The Art of Manliness on how a man should handle a miscarriage. 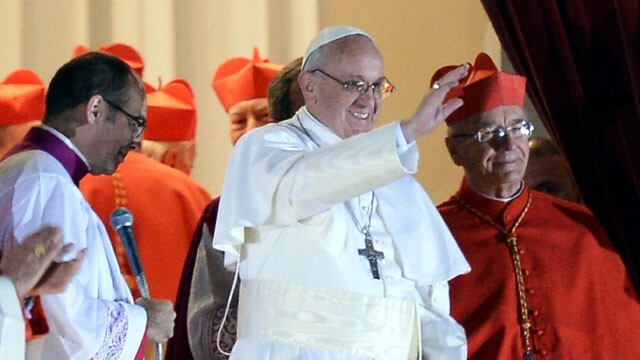 On the Square, William Doino, Jr. asks who is "disappointed" with Pope Benedict? O God, eternal shepherd, who govern your flock with unfailing care, grant in your boundless fatherly love a pastor for your Church who will please you by his holines and to show us watchful care. Through our Lord Jesus Christ, your Son, who lives and reigns with you in the unity of the Holy Spirit, one God, for ever and ever. Who doesn't read on vacation? Whenever I visit the home of a friend I always make a point to visit their bookcases and have a look through their library, however large or small. Whenever I visit the home of a stranger, I do my best to steal a glance at their library. I do this because you can learn a lot about someone by knowing what books he or she reads. Behold the Pierced One: An Approach to a Spiritual Christology - for the second time - by Joseph Cardinal Ratzinger (San Francisco: Ignatius Press, 1986). If memory serves, this was the first book of Cardinal Ratzinger that I read and ever since I finished the final page I hungered for more of his writings. His thoughts in this book really get, I suggest, at the heart of His Holiness Benedict XVI. If the media had read this book nine years ago, all of the talk of the so-called "Panzer Cardinal" would have been shown to be unfounded and would have vanished. This little book makes reading during Holy Week. Quiet: The Power of Introverts in a World that Can't Stop Talking by Susan Cain (New York: Crown Publishers, 2012). This was the second time I read this book, too. It is the best book on introversion that I have ever read and approaches the tendency to introversion through a physiological approach, but in a very readable way, and provides helpful advice for extroverts dealing with introverts and for introverts dealing with extraverts. The Letters of J.R.R. Tolkien, ed. by Humphrey Carpenter and Christopher Tolkien (Boston: Houghton Mifflin Company, 2000). This book is necessary reading for anyone who wants to get to know the heart of Tolkien. Jesus Christus: A Classic Meditation on Christ by the Author of The Lord by Romano Guardini (Notre Dame, Indiana: Ave Maria Press, Inc., 2012. I believe this book is compiled of excerpts from Guardini's The Lord, though I cannot confirm that. This short book is an excellent series of meditations perfect for Lenten reading and has caused me to move The Lord to the front of my shelf of books "to be read". The Vatican Diaries: A Behind-the Scenes Look at the Power, Personalities and Politics at the Heart of the Catholic Church by John Thavis (New York: Viking, 2013). This book is perhaps not for the weak of heart as it exposes some of the failures of members - both low and high - of the Curia. The accounts will make you laugh and sighs at the failures of those who should clearly know better, even as they also remind you clearly of the promise of Jesus that the gates of hell will not prevail against his Church. It seems to me that I also read a sixth book, but I cannot recall at the moment what it might have been (it's probably in a box I shipped home that should arrive on Monday). 6. The Quest for the Creed: What the Apostles Really Believed, and Why It Matters by Dwight Longenecker (The Crossroard Publishing Company, 2013). This is a good overview of the Catholic faith for those who may have fallen away but are maybe thinking of returning. A girl - the daughter of his publisher - once wrote J.R.R. Tolkien asking him the fundamental question, "What is the purpose of life?" Ordinarily, when someone asks this question we tend to laugh it off as though the question had no answer. Tolkien did not. In his response - which he said was "much too long, and also much too short - he pointed ouT that "if you do not believe in a personal God the question: 'What is the purpose of life?' is unaskable and unanswerable." But Tolkien, being a faithful and devout Catholic, did believe in a personal God; so it was that he answered her question in these words: "So it may be said that the chief purpose of life, for any one of us, is to increase according to our capacity our knowledge of God by all the means we have, and to be moved by it to praise and thanks." In the depths of our hearts, each of us knows his understanding of the fundamental meaning of life to be true. If we did not, we would not be here this morning to offer the Most Holy Sacrifice of the Mass. 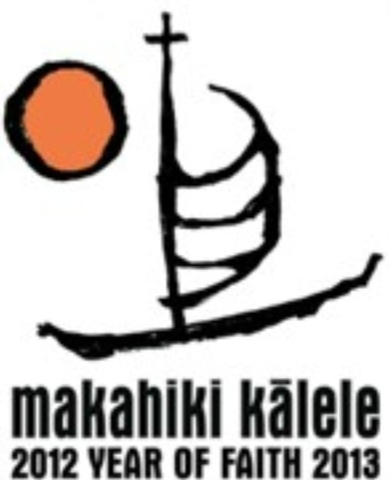 We know that at the heart of this current Makahiki Kalele - this Year of Faith - "is a summons to an authentic and renewed conversion to the Lord, the one Savior of the world (Porta Fidei, 7)." If we are to make this renewed conversion to the Lord, it will only be because we have come to know him more clearly and more intimately. If we are to know the Lord it is first necessary that he reveal himself to us, as he did to Moses through the bush that burned with the mysterious flame (cf. Exodus 3:2). Though he may not have used such dramatic means to reveal himself to us, to you and to me, we can be certain that he has revealed himself to us. The natural beauty of these very islands are filled with many signs of God's involvement with the world. He has also revealed himself to us in many other ways, but in none so profound as in the person of Jesus Christ in whom "God has visited his people" (Luke 7:16). He has revealed himself to us also in our baptisms, when we received a share in his divine life and were joined to the Body of Christ, the Church. He reveals himself in the Scriptures, in the Eucharist, and in the Church. Sadly, sometimes we simply are not paying attention to him. When Moses first saw that bush, he drew near to it because he saw that the bush, "though on fire, was not consumed" (Exodus 3:2). There is in this detail an important lesson for us: Moses could simply have glanced at the bush and continued on his way, minding his own business and tending the flock, but he did not. The curiosity of Moses indicates his openness to the Divine, his search for the Lord. His openness led to his encounter with the God-who-is and his life would never be the same. Rather, his life took the form of a greater knowledge of God through his relationship with him, which also led him to give praise and thanks. Moses' life took the shape of a life of faith and because of his faith he produced great fruit, even if not all the time. If we look at our own lives, can we say that they have taken the shape of lives of faith? Has the direction of our lives turned towards the Lord because of our encounter with him? Do we seek to come to a deeper knowledge of God, born of love, that leads to Praise and thanks? In short, we might well ask, does my life bear the kind of fruit the Lord has come in search of, the love of God and of neighbor? Romano Guardini once commented that "two thin veils keep us from seeing the living truth of Jesus." The first is "the veil of our ignorance." We simply do not know the Lord well - or much about him - because we do not spend enough time speaking with him in prayer, reading the Scriptures, or studying his life. The second "veil is that we think we know, but in truth are just accustomed to hearing the same words, episodes, statements over over again." We simply go through the motions, as it were, and fall into a sort of religiously molded routine, without actually thinking about what it is that we do or what gives direction to our lives. We, like, Moses must recognize the signs of God's presence in our lives; we must be open to encountering him, to knowing him, and to being conquered by him. Only if we live in this way will we live the purpose for which we have been created by Love, in love, and for love; only in this way will our lives bear fruit. Because the Lord wants to find such fruit in our lives, he is "merciful and gracious," "Slow to anger and abounding in kindness" (Psalm 103:8). He is patient with us as we make our pilgrimage toward his face, sometimes faithfully and sometimes sinfully, because of his great love for us. Just as the Lord said to Moses so he says to each of us: " I have witnessed the affliction of my people ... and have heard their cry of complaint against their slave drivers, so I know well what we are suffering. Therefore I will come down to rescue them" (Exodus 3:7-8). What temptation, what sin enslaves us? If we turn to the Lord and seek his mercy he will set us free, but first we must allow his love to permeate our hearts and shape our lives. "If we welcome [his love] with faith," wrote His Holiness Benedict XVI in his Message for Lent 2013, "we receive the first and indispensable contact with the Divine, capable of making us 'fall in love with Love', and then we dwell within his Love, we grow in it and we joyfully communicate it to others." This, dear friends, is the fruit the Lord desires to find in us. He found this fruit in Father Damien and in Mother Marianne in their love for the residents of Kalawao and Kalaupapa. Through their intercession and example, may he also find this fruit in us when at last he comes in search of fruit (cf. Luke 13:6-7). Amen. N.B. Footnotes to be added later.